At first glance the PROMiXX® might look to you like an average beverage bottle. But if you look a little closer you can see that it's not. It actually has a little mixer in the bottom of it that's battery-powered. And when you push the little button at the bottom of the bottle it mixes supplement shakes in no time flat. No more protein shake clumps when you get to the bottom of your drink! And let me tell you I am not a fan of those clumps. I've choked on a few in my time while driving in my car and they were not pleasant. With the PROMiXX® those clumps disappear and all you're left with is a nice smooth drink. 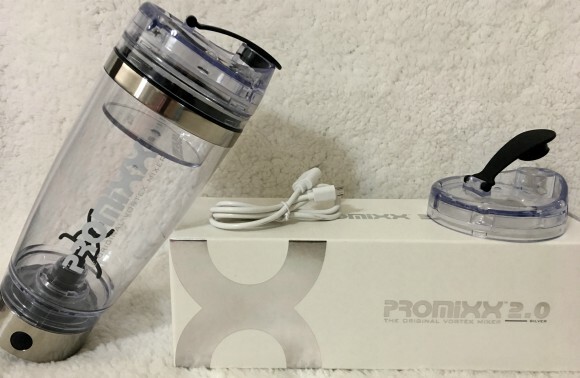 Besides the no-clump results I also like that the PROMiXX® 2.0 comes with a rechargeable battery via the included USB cable. No more worrying about having batteries on hand, just plug it in and charge it up! The World's Most Advanced Supplement Mixer. PROMiXX®, innovators of Vortex Mixing Technology™, are the world's leading brand of vortex mixing bottles - providing perfectly smooth supplement shakes at the touch of a button. Independently tested, PROMiXX® Vortex Mixers have been found to achieve superior mixing results compared to leading conventional protein shaker bottle brands.